As varied and deep as Asian cultures in NYC are, it turns out we've been lacking in at least one culinary area (so much so that even Wichita, Kansas, the chef's home town, has us beat): Laotian food. 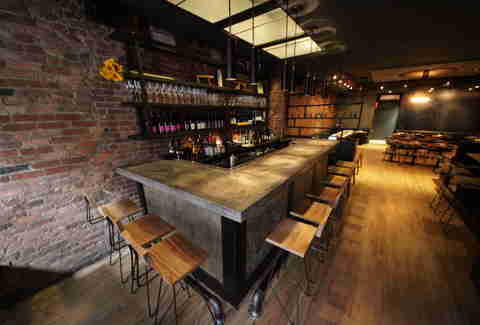 Here to expand your mind and take your taste buds on a neat little trip is "Chef Phet" and Marc Forgione's Khe-Yo, the immediate standard-bearer for NYC Laotian cuisine. 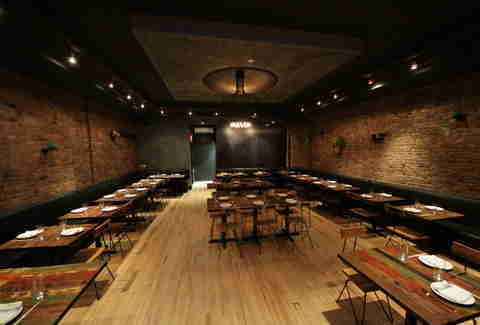 The space is almost temple-like, with brick and metal walls, a massive central recessed chandelier, and coconut mashers and giant elephant art adorning the walls. Sticky rice with bang bang sauce and roasted heirloom tomatoes. This is literally like their "bread and butter" -- it comes out, and you're meant to grab a fistful of rice and dip it in the sauces. "The messier you get, the happier we are." 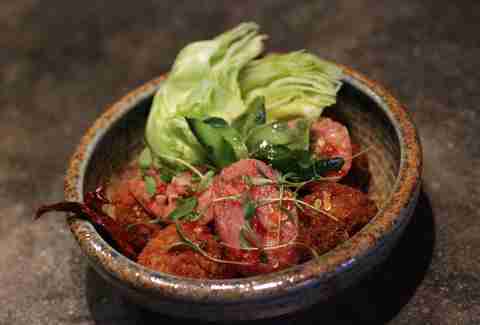 Whenever someone comes out with the very anticipated list of 2013's Top Rice Dishes, expect to see this crunchy coconut rice with kaffir lime sausage in the running. It comes out looking like a bunch of arancini and is quickly mushed and mixed together for optimal flavor-spreading throughout its mashed, spicy, crunchy, meaty-ness. 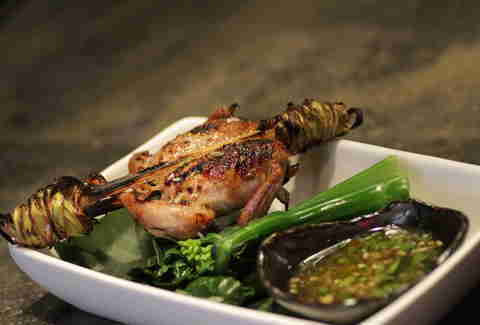 This street food-style "meat on a stick" is quail that's stuffed with ginger and garlic then tied to bamboo and lemongrass stalks. 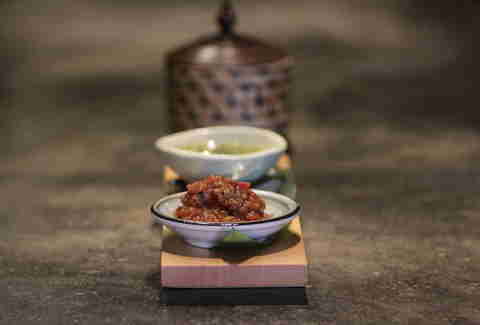 There's even more bang bang here, which is named as such because a mortar and pestle are employed to create the sweet, tangy, spicy, and crazily addictive sauce. 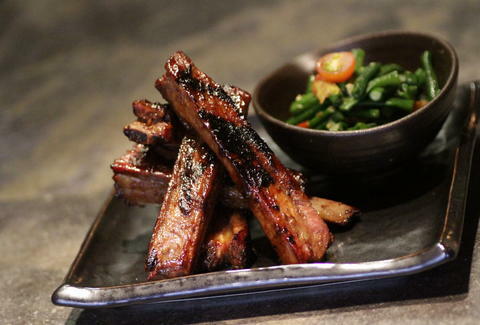 Be nice and share, or take 'em all down yourself, but just make sure to order the lemongrass spare ribs. 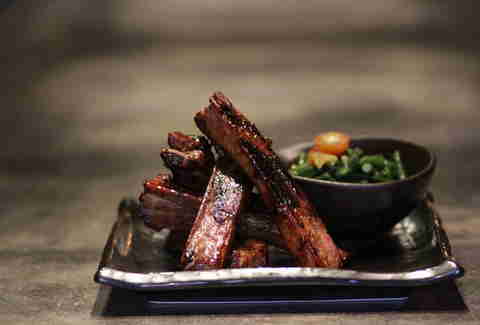 And you can get the whole menu at the big concrete bar while grabbing one of their Southeast Asian-inspired cocktails or a Whiskey Lao Lao, a traditional combination of whiskey and spices for which every single Laotian household has its own recipe. Man, we need a lot more Laos here.